I love supermarkets. Wandering the canyons of bright labels, hearing the languages of aisle numbers and PLU codes, peeking voyeuristically into other people’s carts: to me, these are sensual pleasures that shopping for other things rarely provides. I love the way good grocery stores—whether it’s a neighborhood Food Basket, a sprawling Publix, or a vintage Ralph’s—blend familiar products with new stuff to chance upon. I especially love visiting supermarkets in new cities, because they’re a glimpse into the communities that use them. Young couples in gym attire, moms juggling strollers, aging bachelors who never bring bags: The need to eat and feed families tends to draw a more diverse crowd than other consumer impulses. Like jury pool waiting rooms and motor vehicle administrations, supermarkets (though not all of them) can be among the few places in American society where different kinds of people mix. Amazon Go sells only prepackaged, often pre-prepared items seemingly targeted to the youthful and upscale tastes of the Amazon employees that colonize this corner of downtown. And I guess my tastes, too. Here there be tiny cups of smoked tofu, multiple types of almond butter (chunky was sold out when I visited), flat-iron steak salads, special edition chocolate bars from Theo, a popular local producer. I bought one of those, plus a kombucha and a goat cheese salad. Local IPAs and other craft brews dominated the sizeable beer and wine section, where the second of two human employees I saw checked IDs. As on Amazon-dot-com, prices are as low as you’ll find anywhere else; that steak salad was about $8. The place smelled of convergence: Part of a wall was devoted to snacks from Whole Foods, the splashy recent acquisition of the e-commerce goliath. I watched a woman in a dark coat study the selection before picking off a box of 365-branded cookies and dropping them into her reusable Amazon sack. Other shoppers seemed to be a mix of tourists and puffy-coated tech professionals. But this wasn’t like wandering through a new supermarket in an unfamiliar neighborhood. For one thing, wandering was hard to do. Supermarkets have their CCTVs, but this store is watching you more intensely than a high-security prison. Wall-to-wall cameras and sensors track shoppers, their phones, and each item we pick up and put down via special glyphs printed on the product packaging. And, at 1,800 square feet, it’s more of a convenience store than a grocer, with only a few “aisles” in the traditional sense. It takes only a couple turns to figure out where everything is. (The layout needs to be pretty orderly for the cameras, I’d imagine). A certain sense of discovery was missing in the shopping process. Of course, like its dot-com parent, Amazon Go isn’t supposed to be about the traditional pleasures of shopping, and certainly not about the pleasures of what’s being sold. If either were the case, the store would look a lot nicer than it does, and they would have figured out how to sell fresh produce. 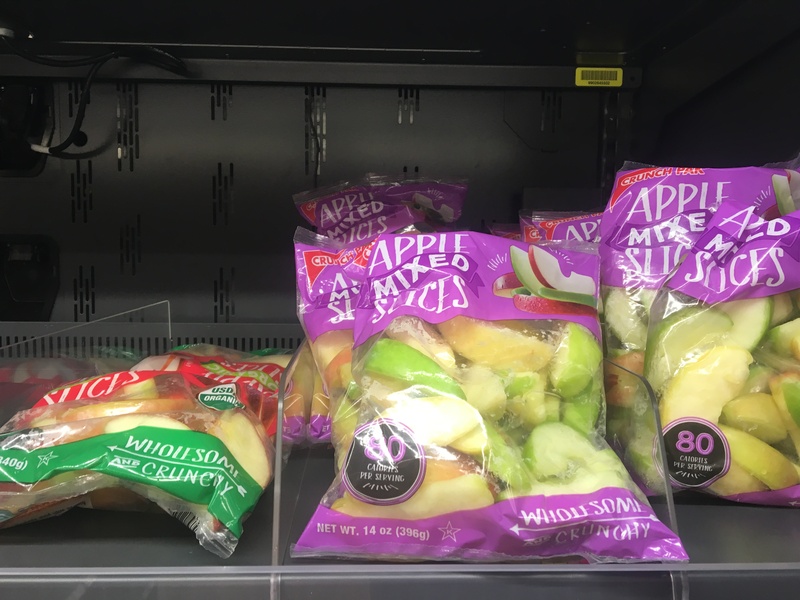 (Let me tell you, no one is buying these sad bags of pre-sliced apples.) Instead, the format is designed instead for speed, convenience, and cost efficiency, with a technology that does all three. Eliminating the teams of workers that currently make in-person commerce possible could cut labor costs substantially. Amazon insists that the “just walk out” technology wouldn’t have to eliminate the nation’s 3.5 million cashiers if applied at scale. But with one greeter and one ID checker per store, it’s hard to see how most people working low-skill retail jobs would fit the descriptions for the some of the new types of work Amazon Go would entail, such as software development. Walking out of the store gave me the same tingly, vertiginous feeling I recall from the first time I “just got out” of an Uber. Having culled the ranks of bookstores, electronics emporiums, and clothing retailers, Amazon is now coming for the grocery store. Whereas once the food sector seemed safe from the company’s appetite for disruption, consumers are getting more comfortable with perishable deliveries. Now, more Americans with the disposable income to pay for delivery are shopping Amazon in lieu of their usual aisles. The acquisition of Whole Foods in 2017 was about the best-shod entry point into the brick-and-mortar world of groceries Amazon could have made, as well as a potential expansion of its array of delivery nodes. “Amazon will never take the whole grocery market, but they’ll take the top 10 percent of the most profitable customers, and few retailers can afford to lose the top 10 percent,” Rich Tarrant, CEO of MyWebGrocer, told Bloomberg in 2016. Large grocery chains that can are competing for those precious customers with their own online shopping and on-demand options. Walmart just announced that it, too, is ramping up food delivery in more than 100 U.S. metros. Some supermarkets are building up their in-store customer experiences—more cheese-tasting tutorials and coffee bars—to keep their doors gliding open. But other locations, in less profitable, lower-income communities, are simply closing. It’s much too soon to say where Amazon Go, as a product, fits into that landscape. Even if consumers embrace the line-free life, the expense and complexity of the technology behind it could easily prevent it from transforming retail anew. “We don’t have any idea if the mysterious system behind Amazon Go can be distributed at competitive cost and at scale, like an iPhone, or if it is an expensive, one-off display of ingenuity, like the many gewgaws corporate America once paraded at the World’s Fair,” Henry Grabar wrote at Slate in January. But to me, Amazon Go represents something more chilling than a direct threat to storefronts. It feels like a physical embodiment of the larger social transformations its online parent has helped create. A segment of upscale-good shoppers—people like me, spenders on kombucha and goat cheese—will get to shop hassle-free, whether it’s online, at a Whole Foods, or one of its newly decked-out competitors. That’s great for us. But that leaves a lot of other people out of the equation, because they can’t afford online delivery, or because they live in neighborhoods where groceries can no longer justify the cost of operating. (At least one online petition has been launched to encourage Amazon Go to accept SNAP benefits, the federal food assistance program.) That could fray cohesion in those communities and, maybe, push apart the social mix that grocery stores can do so well. And never mind all those retail workers, who more or less disappear from the privileged shopper’s view. As demographically targeted as its products must be, Amazon Go isn’t really about any local experience. It’s one more expression of the wide-reaching impulses of a multinational corporation that wants to sell me everything it possibly can. The appeal is undeniable. Those of us who can shop there—because we have credit cards, smartphones, and a taste for probiotic-infused beverages—will, for all the reasons I keep shopping on Amazon-dot-com: It’s easier and cheaper. And, at least for now, the new technology is a thrill. Yes, a thrill. Walking out through the Amazon Go turnstiles—with no human cashiers or attendants, no lines to judge or wait in—gave me the same tingly, vertiginous feeling I recall from the first time I “just got out” of an Uber. It was the sense that I’d mastered some previously onerous urban chore. As I sat down with my salad in an eating area equipped with wifi and USB connections, I refreshed the Amazon Go app to see if my receipt had loaded. Within a few minutes my three items popped up—another little jolt of excitement. As I took screenshots, a young man in a slim puffer jacket sat down next to me and began to silently pray over his bahn mi and seltzer. When he finished, we chatted. His name was Keith. He was a data scientist for Amazon. He’d moved to Seattle from Kansas City. I asked Keith how he got to work every day (I was in Seattle to report on its transit system), and he told me drove his car from Bellevue, the suburb he’d moved to after years of living in the city. But he actually missed taking the bus, he said, for the feeling of human connection—the chance to bump against people he never gets to otherwise. It occurred to me later, after my giddiness wore off, that perhaps there’s a similar threat in this one-trick automat. Obviously, Amazon Go can engineer possibilities for human connection into its otherwise frictionless space; sharing a moment with Keith proved that. The question is who’s invited in, and who’s getting walked out.